Last December , I was in Coimbatore, in Tamil Nadu, a self-made city built by the enterprising instincts of Kongu Vellalars (Gounders) and Naidus, the two major communities that pretty much built the city and the region surrounding the city from scratch, with practically no support from federal or state governments or investments in public sector companies. The medical care facilities in primary, secondary and tertiary healthcare in Coimbatore is as good as it is in Chennai, only less expensive. Kongu Vellalar’s (Gounders’) and Naidus’ footprints are everywhere in Coimbatore and its surrounding area — in elementary, primary, secondary education in schools they have build in the names of their parents; 4-year colleges in arts and science; medical and engineering colleges; hospitals, primary care centers and charities in their parents’ names; small and medium businesses and industries; and in supporting temples and patronizing performing arts. In the arid Kongu region where one needs to go 300 to 400 feet deep to get water, these people of the region also engage in farming and agriculture. That is how hardworking and enterprising the people in the region are. 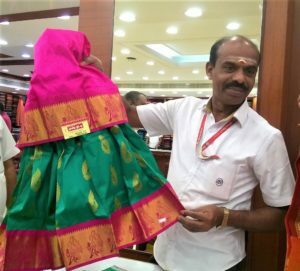 We were in the shopping area along Hundred-Feet Road in Coimbatore looking for a Pattu Paavaadai (reshmi lehnga) for my 3-yar old grand daughter. Hundred-Feet Road had several showrooms for silk saris and gold/diamond jewelry. These shops specializing in silks only sell the fabric in pure Kanchi and other specialty silks for Paavaadais for 2 to 12-year old girls. The Paavaadai fabric, like expensive saris, comes with matching material for the blouse integrally woven at one end of the fabric. I don’t know what he did, or how he did it. Within 30 seconds, he folded the single piece of silk fabric in a few complicated steps. Bingo! Magically, he made the same piece of fabric look like a paavaadai-blouse pair. I asked him to pose for a picture. And here it is. Editor’s Note: Rahul Dilip Tendulkar was born and raised in Grand Blanc, MI. 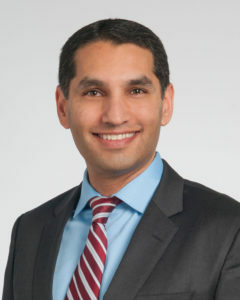 He went to medical school at the University of Michigan, and finished his residency in radiation oncology at the Cleveland Clinic, where he is at the Taussig Cancer Center. He married Rajani, daughter of Arvind and Deepa Koimattur of Monroeville. The Tendulkars and their two daughters live in the Cleveland Metro area. Rahul enjoys traveling, publishing papers and tennis. Rahul and Rajani with their kids in the hotel lobby. 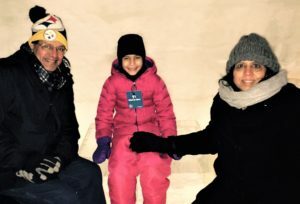 amira, myself, and her parents Deepa and Arwind Koimattur, we packed our bags with extreme cold weather gear to withstand the arctic blast that weathermen were predicting to sweep through the continent. The Hotel de Glace, which is only open from January to March each year, is constructed by local artists who spend weeks putting together the massive structure out of snow and blocks of ice. Like a giant igloo, the indoor temperature remains surprisingly constant around 25 degrees F despite the subzero wind-chill temperatures outdoors. 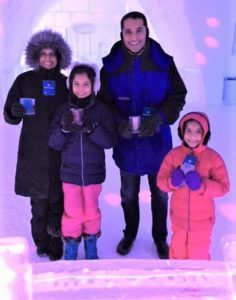 Aravind Koimattur enjoying the freezing cold with his wife Deepa and grand kid at the ice hotel. distinctive guest rooms. The bar area was equipped with bright LED lights, dance music, a fireplace, and drinks served in glasses made of ice — it was quite the party! Intricately designed ice sculptures were there in every corner and even hanging from the arched ceilings. Home, country, kinship can mean different things at various stages in your life. Confusing? Maybe not. For those of us who were born in one nation, but now call another our home, these concepts have been shifting. Ponder this: for many of us going to India on our first visit after being here for several years, it brings forth choking emotions of nostalgia, love for the place and people, self-doubt on our leaving India, even patriotism. However, after a few decades of living in the ‘Burgh, when returning from India, just a glimpse of the Three Perennial Rivers from the plane before landing gives us the relief and comfort of being home. With nostalgia, after thirty years, last December, I created an opportunity to travel through the lands where my parents were born and lived until adulthood — small-town Kerala they were from for generations before moving to Bombay, where they raised a family. We settled on an 8-h long train journey along the West Coast of Southern India from Mangalore to Coimbatore. I had taken this route at least ten times from childhood through my young adulthood. People talk about the past flashing before their eyes. As the train was gently going past several small stations, memories of past images gushed past in my mind as I was looking through the window! Coconut palms just 50 yards away from the railway track. We boarded the train early in the morning at Mangalore Junction after going to the famous Mookambika and Udupi Temples. 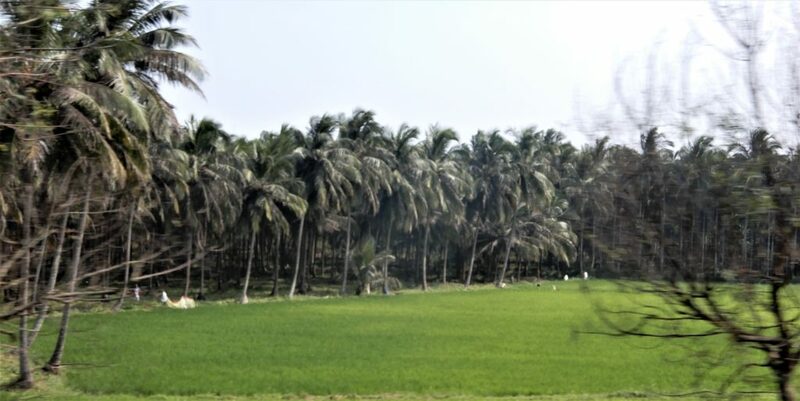 As the early sun was drenching the landscape with light, the train was gently going past a land of coconut groves densely dotting the green paddy fields. Acres and acres of green fields, stretched on a land watered by plenty of streams and rivers. Backwaters washed over the land, with bobbing fishing boats headed out to the Arabian Sea visible through the window. One of the countless homes along the track nestled around coconut palms. The scene was so reminiscent of the many trips I had taken in my childhood traveling from Bombay to Kerala to visit grandparents and family. I distinctly remember now, as you enter Kerala from Coimbatore, the changing landscape from Tamil Nadu was so sudden and dramatic. That is why India has so many diverse languages and food preferences. Palakkad Junction, nostalgically familiar to those from Kerala. 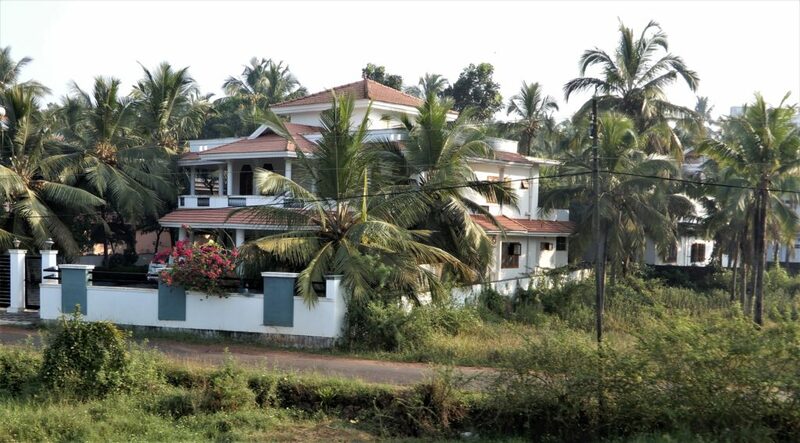 We passed through Kannur where my maternal grandfather taught mathematics and accounting at the European High School — the grandfather, I remember, wore a linen jacket and a cotton turban. We moved on to Thallassery, famous for black pepper, the home of my mother and her large family, onto Mahe, my father’s hometown. The train chugged on through Badagara where my parents lived for a short time before moving to Bombay. I re-lived the many stories told by my relatives at several family gatherings in my childhood. 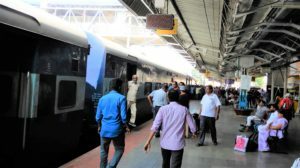 About the Indian railways in South India: Having traveled in European and US trains, I must say, the Indian Railways system does an amazing job, when you consider that over 10 million people are on long-distance trains every day, and how relatively affordable the second-class tickets are to average Indians. A great improvement in the trains is new toilets that collect waste products, like in airplanes, leaving the railway tracks en route clean. Ticket purchase is now as easy as on-line booking of airline tickets. The tickets give all the information of compartment number, (as the rail cars are called in India), its placement on the station platform and seat numbers. You are able to board the train with comfort and with no anxiety. The railway platforms in big stations are typically 1000 yards long. 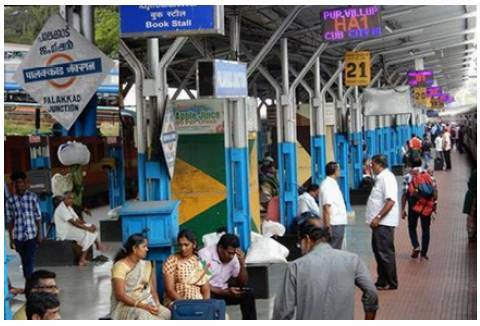 South Indian train stations are clean with enough seating for weary travelers. The longest trains, with 24 rail cars, are over 650 yards long. 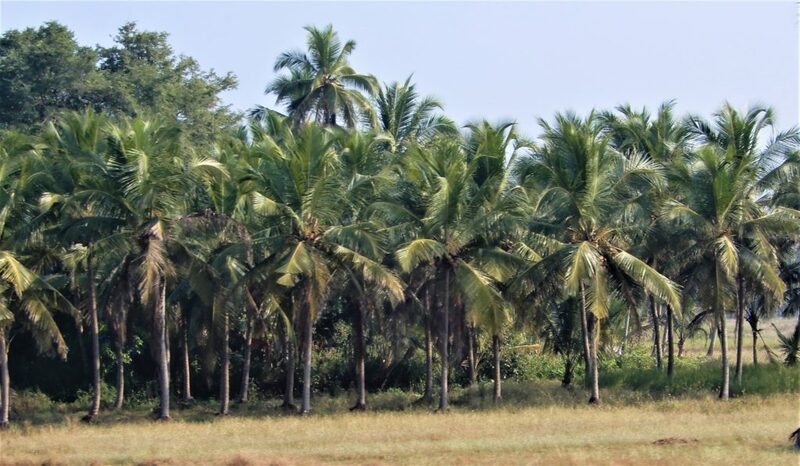 Verdant paddy fields in front of coconut palms — a common sight in central Kerala. The railway staff was courteous and professional. A new development that pleased me was: all employees at stations waving the trains off were women in smart uniforms! Also, now women are in the driver’s seat, running the heavy electric locomotives in suburban trains as well. The range and quality of food at the South Indian railway stations did not disappoint me. The food and newspaper stalls are all privatized, with lots of local delicacies. Snack packs of salty banana chips, cookies, halwas, crackers, and murukkus are available everywhere. We had appam and stew for breakfast at the station. Our boxed lunch of rice, sambar and yoghurt too were served fresh. Nonvegetarian lunches too are available. One suggestion if you are travelling in long-distance trains: Take paper napkins, fork/spoons and bottled water before leaving home; and also some large trash bags to put all the waste you will generate. Editor’s Note: After earning his degree in architecture from the MS University in Vadodara, Gujarat, Mahendra Shah, migrated to the U.S. in 1974. 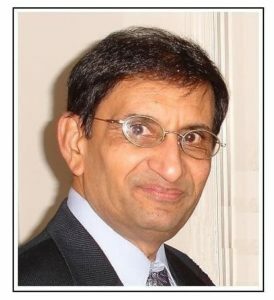 Mahendra, a successful entrepreneur and businessman for many years in real estate and retail businesses, is an enthusiastic contributor to the Pittsburgh Indian community. Over the years, he has recorded his humorous observations on immigrant Indians in America in more than 1500 cartoons. He is also keenly interested in poetry, essays and paintings. 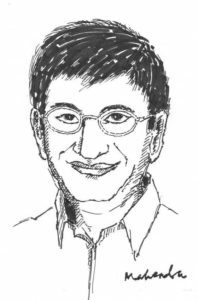 His work was originally published by Pittsburgh’s Gujarati magazine and is now featured in several publications and exhibitions. time. He narrated the story in such a lively fashion that you felt as if the entire scene was being played out right in front of you. Growing up shy and somewhat reserved. 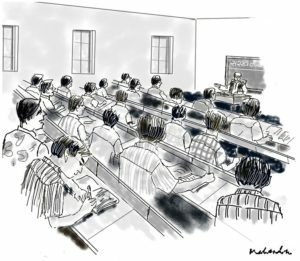 I preferred to sit in the back of the classroom trying to avoid answering questions. I often wandered off into my own thoughts. In one class the teacher began reading the story in which Saraswatichandra was going from his village to meet his fiancee in her village. He was walking through a wooded forest and ran into a poisonous snake. As I was listening to the story unfold, my mind began to wander in its usual fashion. I began to doodle in my notebook, at first somewhat aimlessly, but then, the teacher’s words grabbed my attention. 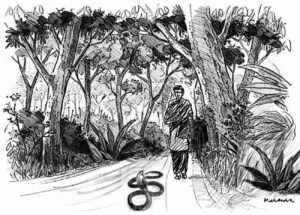 As he began describing the poisonous snake creeping closer and closer to Saraswatichandra, I started imagining and drawing the whole scene as a pencil sketch. All other students were mesmerized by the teacher’s reading of the story. They were frozen in their seats in anticipation of what was to come next. The room was absolutely still except for me. My eyes were glued to my notebook as my fingers were busy doodling and drawing out the scene that the teacher was narrating. Suddenly, the teacher’s eyes set on me and he noticed that unlike the other students, my attention was not fully on him. He stood from his chair and menacingly stared at me. I was frozen stiff. I was certain I was in an enormous amount of trouble. I had never been this frightened in my entire life. I approached the teacher with my notebook and was terrified of what would come next. Immediately, he asked me to hand over the notebook and opened it to the page full of my doodles. As he looked closer and closer at my notebook, his face stiffened. I was sweating in fear. I was expecting the worst. Several seconds passed as he riffled through all the pages. Slowly, I saw that his frown was gone. When he finally began to talk, he showed the entire class my sketch of the story. He praised my drawings and said that they were the best narration of the story! I felt such a sense of relief. Not only was I not in trouble, but from that day on, I was known as the “Resident Artist” of the school. I was commissioned to execute all art-related projects — posters, banners, and others — for school events. After my education, I married and came to the United States. The responsibilities that came along with work and family made me put my art on the back burner, but I always kept doodling or sketching in my spare time. Our children had grown and started lives of their own. Several years ago my daughter and son-in-law were visiting us. They had just moved to a city only a couple of hours from Pittsburgh. When I returned from work in the evening, I was surprised to find my daughter exploring my art portfolio. It had been sitting in the attic for years, and I had nearly forgotten about it. In fact, we were preparing to move to a new house, and the album was meant to go into the trash pile! A few weeks later, we went to visit them in their new apartment. When we entered the house, to my utter surprise and delight, I saw a few of my paintings and drawings hanging nicely on the walls. They were framed aesthetically too. I was so touched. It felt wonderful to have my art appreciated again after so many years by my own children..
Francis Cleetus happily poses for the Patrika in front of one of his painting collections. On a wintry January evening, the Greater Pittsburgh Arts Council organized a Gallery Crawl for lovers of the visual arts to “crawl” from one venue to another to enjoy the works of Pittsburgh-based creative minds at several galleries and public places. The artists were also present to answer questions; music programs and a comedy improv also were part of the crawl. 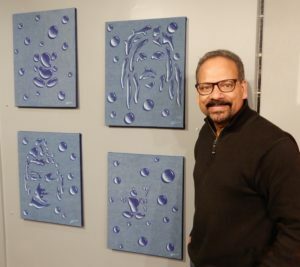 Part of the crawl was the works of Indian-American visual artist Francis Cleetus at the gallery at 810 Penn Avenue downtown. 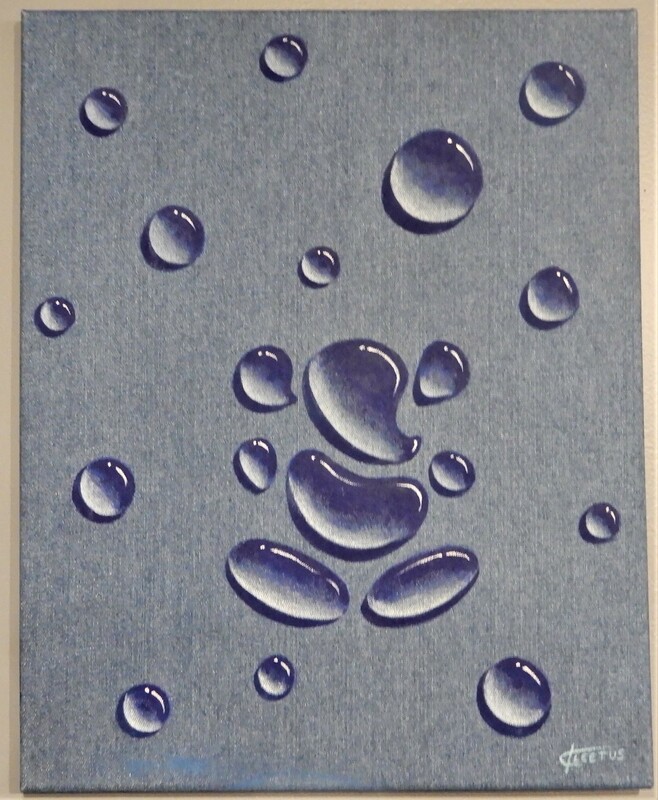 Cleetus has brought 3-d effect simply by imagina-tively using the effect of light and shadows in a 2-d painting. Do you see a Ganesha in this? Cleetus was born in Bombay (now Mumbai). “Even from my early childhood, I always had interest in visual arts,” he says. He helped friends with their drawing-related homework assignments at school. He says, “My dad, who worked for Reader’s Digest, encouraged me in my pursuits.” Cleetus went to St. Pius High School in East Bombay, where his English teacher Mary D’Souza encouraged his creative pursuits. She was his inspiration. 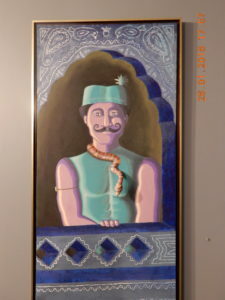 A painting of Cleetus shows a snake in 3-d.
developed his style as a painter, designer, illustrator, cartoonist and sculptor. But Cleetus had no formal education or training in visual art. His talents are instinctive, endowed by Mother Nature. After living in Hong Kong for nine years with his wife Maneesha, Cleetus joined MARC Advertising as its Creative Director in Pittsburgh. A few years ago, when Phipps Botanical Conservatory organized Tropical Forest India, a 3-year live exhibition, Cleetus’ mandala-type painting decorated the roof of the South-Indian-style entrance created by our own Sthapathi Ayyachami Narayanan of Monroeville. Cleetus is currently with Mylan’s global creative & design services team working on logo designs, print ads, billboards, digital ads, websites, exhibitions and more. When asked why all of his paintings on display are inspired by Indian themes, his reply was quite simple and direct: “Because that’s who I am.” But his sculptures and drawing also have universal themes in terms of imagery. 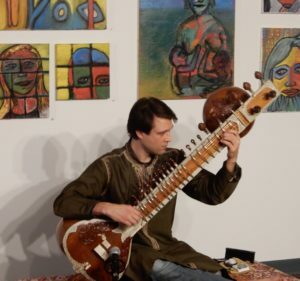 On the inaugural day, Michael Griska was on the sitar adding to the excitement and enjoyment. See the picture on the side. Cleetus lives in Upper St Clair with his wife Maneesha and two daughters, Ananya and Antara. More information about Cleetus is here. Nandini Mandal has now become synonymous with a talented dancer, teacher, brave and resilient survivor, and a cultural ambassador of India in Pittsburgh. It was a long, difficult but exhilarating journey. We have known the ever-smiling Nandini since she came to Pittsburgh. She was not a household name when she landed in Pittsburgh from India in 1995. She being from Bengal, her talents were first recognized in the Bengali Association of Pittsburgh. Very many years ago, she was invited to give a performance for the Annual Triveni Family Variety Program. Her amazing dance pieces are still talked about. Just as a rooster cannot take credit for the sunrise, Triveni International cannot take credit for the trajectory of Nandini’s rise in the area; it was just one of the many platforms. It did not take long for Nandini’s creativity to be known to all Indians — and also non-Indians as well — in Greater Pittsburgh Area. nts. Her mother, a school teacher, took Nandini to dance lessons. Her father, working in the Indian Railways in Kharagpur, too was very supportive. She started getting formal dance training when she was seven. In 1983 she obtained Junior Diploma in Hindustani Classical music. 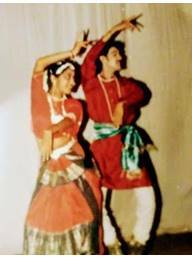 She earned her Senior Diploma, Sangeet Prabhakar, from Allahabad University with distinction in Bharatanatyam at the age of 14 under Guru Snigdha Pal. In the same year she completed her Arangetram. She also got training in Kathakali, Manipuri, and Nava-Nritya. Credit for the variety of dances in India, she tells, goes to traders and invaders who added new touches to the already existing Natyashastra-based dance traditions. 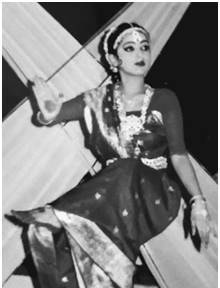 Later, when she continued her education in Calcutta, her passion for dance followed. She trained at the Kala Mandalam focusing on Bharatanatyam and Nava-Nritya. With MaryMiller, Ashish Sinha and Nidrita Mitra-Sinha, 2012. Her Bharatanatyam was Tanjavoor School (Gharana). Her structured courses on the theory of Indian dances at college were extremely helpful when she took practical classes under traditional teachers. After her marriage, she came to Pittsburgh where her husband was employed in the early boom period of the IT industry in the US. The Mandals are blessed with two daughters. 98, where she is the director since inception. 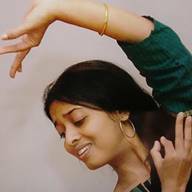 She teaches Bharatanatyam, Nava-Nritya, Folk, and contemporary dances. In her classes in Pittsburgh, she tries to teach her students the theoretical foundations to the extent possible. In life, nothing goes up in a straight line. She developed aplastic anemia which required multiple blood transfusions. Her Indian friends in this town gathered together helping her in many ways — anything from arranging food, monetary help for the long duration of hospitalization and medical care, and social support for their beloved Nandini aunty teacher, mentor and friend, and her betis. This, combined with her grit and determination to live to full under very trying circumstance and share her God-given gift with children and adults, made Nandini survive through the ordeal. Due to her sickness she lost movement in her thigh bone joint. This required joint replacement. For any dancer, this generally means end of dancing career. But Nandini is not any dancer. Her obstacles did not stop there. She continued with her dance, while restricting her acrobatic moves. Jugalbandi with Kathak’s Anupam Kanti Chandra, 1991. In the middle of all this, she developed an aggressive form of Acute Mylogenous leukemia. The only cure was bone marrow transplant. Her social network once again went into full gear searching for a compatible donor all over the world. An anonymous donor’s marrow matched. She went through a successful surgery, followed with chemotherapy and a lengthy recovery period. She was fragile, having to raise two daughters. She endured through all this with her grit and smile, and she was able to beat the disease, usually associated with high mortality rate. She credits her survival to the excellent timely care by cancer experts in New York and well-earned social support she received from friends. The strong will to live also critical. All through this, simultaneously she was struggling with personal issues too. She and the family survived this bitter part of their life as well. She credits her father’s support and for her and positive attitude for coming out of the many challenges. 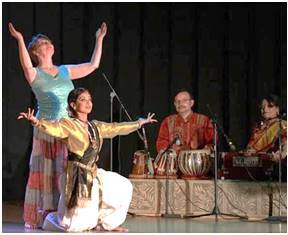 She spreads her understanding of dances, music and various facets of India in numerous schools in and around Pittsburgh. As the cultural ambassador of India with World Affairs Council’s Pittsburgh Chapter, she did a series of lectures at schools in Allegheny and Washington counties. She actively has collaborated with local artists such as Mary Miller, Africa Yetu and Dr. Sheila Collins. She has performed dances in the presence of Mother Teresa, Dr. A.P.J. Abdul Kalaam, and India’s Air Chief Marshall where she raised funds for the fallen soldiers. Teaching 8-to-10 year olds in the Hill District’s YMCA. After receiving so much help from society, she is conscious that she needs to give back to the society. Her fundraising activities include Light the Night Walk for Leukemia Lymphoma Society, Dance for Cure for the American Cancer Society Relay for Life. A video of her choreographed dance is being used in India to help raise awareness for need of sanitation facilities for girls. A still photograph of this video, taken with the fountain at the Point State Park in the background was on the cover page of the Pittsburgh Patrika. Nandini is one of the recipients of the Artist Opportunity Grant of 2016. Due to the efforts of Nadanik Dance Troupe, the Mayor of Pittsburgh issued a proclamation declaring November 14, 2014 as Prakriti Day. Recently, in February 2018 her efforts and talents were recognized by the Pittsburgh Art Council. She is the first Indian/American to receive a grant of $12,000 for the production of Vilaya. 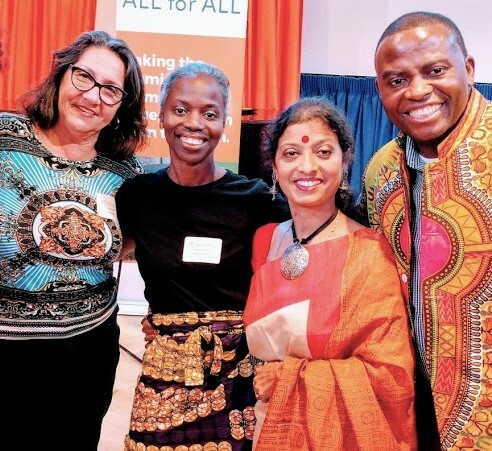 As a panelist at the All for All Summit at Alphabet City 2017 as an immigrant artist and art activist with Olie Kahnu of AfrikaYetu, Janeira Solomon of KST. In addition to teaching and choreographing dance programs, she enjoys reading, listening to good music and gardening. There is not a dull moment in her life. As our present government scurried to create a new tax code before the end of 2016, it will be worthwhile to know how the tax code evolved in this country. The first income tax bill was introduced in 1861 as a one-time event to raise money for the Civil War, which the then president Abraham Lincoln signed into law the same year. It was meant to be a temporary measure with a flat tax rate of 3% on annual incomes above $800 (equivalent to ~ $22,000 per year income today). In 1862 congress created what would become the Internal Revenue service. This tax law lapsed in 1872, and there was no income tax till the year 1894 when congress passed law to in recreating income tax code. At that time the Supreme Court by vote of 5-4 voted that the income tax code was unconstitutional. A progressive reform group fighting to reintroduce the tax code led to the passage in 1913 of a constitutional amendment – the 16th amendment – legalizing federal taxation. The first implemented permanent tax code had a top rate of 7% on annual incomes above $500,000 which would be equivalent to $12.5 million today. The U.S. Government later passed a massive tax hikes to pay for the world War I, including the first version of the estate tax, and raised the taxes yet again to finance the enormous costs of World War II. In 1944 the top income tax rate peaked at 94 percent on taxable income of over $200,000 (about $2.5 million today). In 1963 President John F Kennedy slashed the top rate for individuals from 91 percent to a more reasonable 65 percent. This reduction met with still resistance from conservative Democrats and Republicans who worried about the deficit it will entail. When Lyndon Johnson became the president after Kennedy’s assassination, the Revenue Act of 1964 was passed lowering the top individual tax rate to 70 percent and the bottom rate to 14% from 20%. 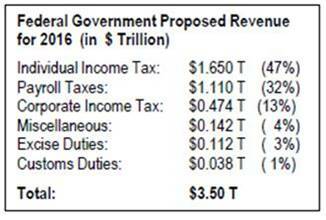 At the same time the corporate tax was also lowered from 52%to 48%. Another seventeen years elapsed before the next tax reform took place under President Ronald Regan. He created the biggest tax cut by slashing the top individual rate from 70% to 50%. He and his advisers revamped the tax code and introduced the 1986 Tax Reform Act simplifying the tax and reduced fifteen tax brackets to just two, 15% and 28% percent. This tax code also eliminated $60 billion tax loopholes. It was felt to be revenue neutral. To appease few resentful congressmen and senators, Reagan increased the standard deduction to benefit low-income families. He also increased the capital gains tax from 20% to 28%. President George W Bush pushed through a major tax cut in 2001. Later Democratic presidents have raised the top tax rate to 39.6% and the number of tax brackets was expanded to seven and several new tax breaks and loopholes were been added. During President Donald Trump’s first year in office, the Republican controlled House and Senate succeeded in rewriting the tax code. After cantankerous debates both in the House and Senate, the Republicans managed to pass the bill, solely along the party-line vote. It was necessary to raise the debt ceiling. The new tax bill reduces the corporate tax from 35% to 21%. It reduces personal tax bracket from eight to seven. It reduces individual taxes to many Americans. The new bill increases the personal standard deductions from $12,000 to $24,000. The present bill reduces the property taxes and state taxes deduction to $10,000. It reduces mortgage interest deductions for new houses up to $750,000. Some changes were also made in the estate taxes, and alternate minimum tax, and gift taxes. 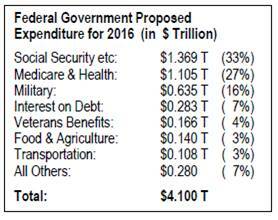 The new budget increase spending on defense, infrastructure improvements, mental health care, and Catastrophic Fund. This new tax law will not be budget neutral and will leave an enormous deficit. Congressmen of the future will have to reconcile with this huge budget deficit. The US Congress, as required by the US Constitution, has 435 Members in the House of Representatives, elected from 435 electoral districts from 50 states. Each Congressional district must have approximately the same population (~ 720,000 people). Congressmen are elected from each state from “Congressional Dis­tricts,” which are specific geographical areas within the state. The map for each district is redrawn every ten years. The Pennsylvania legislature’s General Assembly (lower house and the senate) in Harrisburg has the authority to redraw the map after each census. However, the governor has to sign off on what the General Assembly proposes. Pennsylvania is a Moderate State, Relatively Speaking: In elections for the US president and US Senate, the vote split between Democratic and Republican can­didates has been between 45:55 or tighter swinging either way. We have voted both for Republicans and Democrats in presidential elections; we have had both Democratic and Republican Governors and US Senators. So, Pennsylvania is a moderate state, relatively speaking. That is, Republicans have 67% of the state’s 18-member Congressional Delegation to the US House, even though the state votes 48-52, swinging either way in presidential and Senate races. Republicans garnered such a dis­proportionately skewed advantage in the US Congress by gerrymandering congressional district maps. They did this by banding and breaking voters identified to vote against them. Banding: Segments of voters, mostly urban, well known to vote Demo­cratic (for example Blacks, Jews, Asians…) would be herded together into very few districts such that in these districts Democratic candidates would win with an 80%-plus majority. Breaking: Where it suits them, Republicans have drawn the district maps dispersing Democratic voters in a densely populated urban area into multiple Congressional districts thus diluting their effectiveness against them, and gaining a clear advantage for winning in the general elections. In many districts, once you win in the primary, you coast to vic­tory in the general election. The intra-party primaries are where the battle is won or lost. To know what gerrymandering is, just look at the example of the 7th congressional district, near Philadelphia shown below. The map of the Congressional districts of the last several election cycles is also shown below. The rural districts are large because they are sparsely populated. 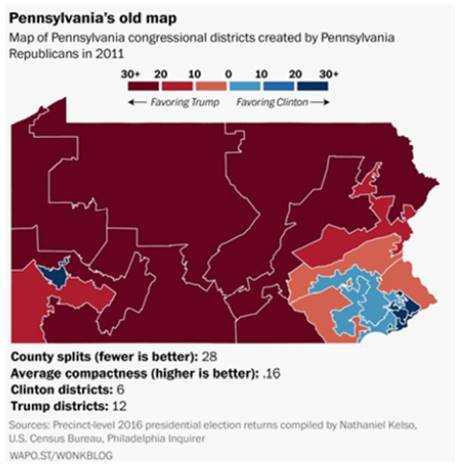 This way of drawing the districts gave a disproportionate advantage to the Republicans for winning 13 of the 18 House seats from Pennsylvania — more than 2/3 of the seats. Republicans have been in the majority in the Pennsylvania General Assembly for years. This time, a Democrat (Tom Wolf) is the Governor in Harrisburg. Understandably, the governor did not sign off on the Republicans’ gerrymandered redistricting map. When the issue went to the state Supreme Court — the League of Women Voters filed the law suit — the court asked the General Assembly to revise their redistricting map, because the Republicans’ plan was ‘”aimed at achieving unfair partisan gain.” The revised redistricting map of the General Assembly too was not endorsed by the Democratic governor. Based on votes cast in the 2016 elections, the new map gives a 10/8 split between the GOP and Democrats compared with the disproportionate 13/5 advantage the GOP now has in the Congressional delegation. 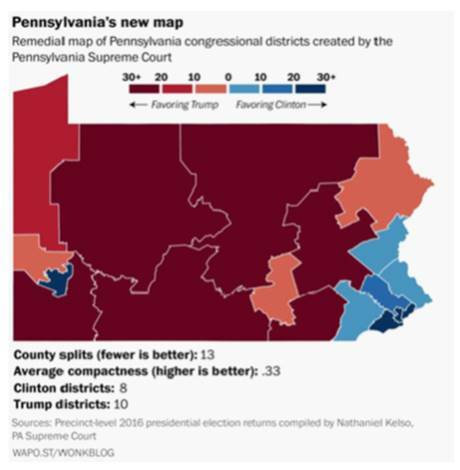 With a more level playing field now imposed by the Pennsylvania Supreme Court, the 2018 mid-term elections to the US Congress in the state become more competitive, representative, and also equitable, in the context of the voting pattern in the state. We thank the state Supreme Court for correcting the grossly unfair way the GOP-controlled General Assembly in Harrisburg gerrymandered Congressional districts. This and similar decisions in other states cor­recting the blatant gerrymandering by both parties can finally moderate the partisan deadlock we have been seeing in Washington for the last two decades. A Mother’s Dream will continue…. By Ameeta Ambe for Friends of Nandini, South Hills, Pittsburgh. 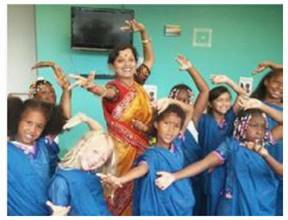 As many of you may know, Nandini Mandal – Principal and Artistic Director of Nandanik Dance Academy, in South Hills, Pittsburgh, has been going through a trying phase in her young life of thirty nine years since early 2009. She was diagnosed with Myelodysplastic Syndrome (MDS) in early 2009 which, progressed to Acute Myeloid Leukemia, a type of cancer, within a few months. With bone marrow transplant as her only alternative for a chance at recovery she spent some stressful months awaiting a bone marrow match. Nandini put her dreams on hold while she courageously & admirably fought through the tribulation of finding a match & getting the transplant at NY’s Memorial Sloan Kettering Hospital. Thanks to the generosity of one kind soul, an angel who, by donating the matching bone marrow made the difference of life to Nandini! She is now able to go back to dreaming of a life with her 2 beautiful young girls Roosha (11yrs) and Raka (3yrs), who need their mommy! We request the readers of this story to take the first step of registering for a Bone Marrow donation. You could be the one saving a life too and making a difference to someone’s dreams. To get answers to any of your questions and concerns about Bone Marrow donation, visit www.marrow.org. Be an informed donor and hold the power to save a life. After surgery at the Memorial Slaon Kittering Hospital in New York, Nandini stayed in New York at an interim housing provided by Hospital, trying to return to her independent self. In early March, Nandini returned to Pittsburgh in great spirits. Her further recovery will be overseen and followed up by transplant doctors at UPMC. Nandini conveys her heartfelt thanks to the community in Pittsburgh and beyond who prayed for her well-being and speedy recovery in her trying time. 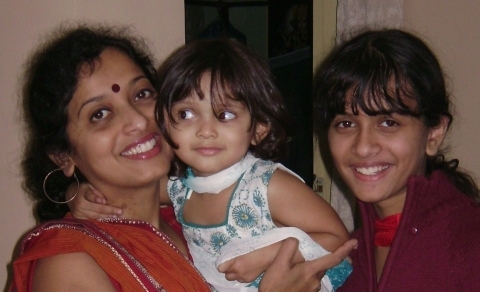 Your blessings inspire Nandini to fight the fight of her life. The website developed by her friends www.friendsofnandini.org, continues to update the community’s bighearted support not only financially but also through the volunteering efforts at the different events put forth by the Friends of Nandini. We, the friends of Nandini profoundly thank all those who have come forward and helped us help Nandini and truly appreciate all your assistance in different areas. We extend our thanks to several local Indian restaurants & Indian stores that donated food, gifts as well as gift certificates towards making the Holiday India Fair/Indian mela held on Dec 5th 2009, a grand success. Helping someone in the time of need can be a joy – and we are gratified that several of us in Pittsburgh have come forward to do our best. We will keep you informed in the days ahead on our future activities and events. 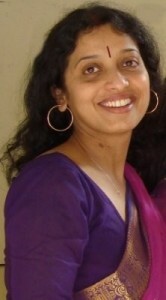 To donate online, visit www.transplants.org search for Nandini Mandal. Please write ‘In honor of Nandini Mandal’ in the memo line. 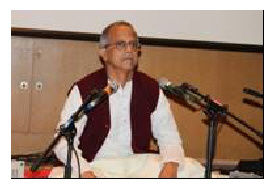 The lovers of Hindustani Classical music were in for an autumn treat on the weekend of November 14, 2009. Chhandayan, with grant support from the Pennsylvania Council on the Arts, presented a memorable evening of Hindustani classical vocal music at the Graduate School of Public Health auditorium in Oakland. The highlight of the show was a vocal presentation by Pt. Sandip Ghosh of Kolkata, well supported by Pt. Samir Chatterjee, Director of Chhandayan, on the tabla. Dipanjan Das of Pittsburgh provided the vocal and the harmonium support. His first presentation was a bara khayal in the raga Bihag. The gift of Sandip Ghosh’s melodious voice was detectable as soon as he started his Alap setting the listeners in a relaxed mood. As the presentation moved into jor, the serene and reposeful feeling of the raga was engulfing the whole auditorium. The Bandish Jiske Dil Par Gujri started in vilambit ektal with a romantic mood and this feeling kept on building up through swift, bold, and intricate tans as the tabla took the bandish into a higher tempo sitarkhani beat. Ghosh finished the raga in a tarana that was both mesmerizing and intoxicating. The standing ovation at the end was the singer’s reward for a well rendered presentation. The listeners were in for more with his next piece – a chhota hhayal in raga Jog Kaus. Peeray Parai… was presented in a classic Kirana style. The finishing piece was “Mohe Lagi Lagan Guru Charanan Ki” — a bhajan in raga Shyam Kalyan in Teen Tal. The other part of the evening presented at the beginning of the program was a jugalbandi – a vocal presentation by Nidrita Mitra Sinha of Pittsburgh and Soumya Chakraverty of Virginia on Sarod. Asish Sinha and Debupriya Nayak accompanied the artistes on the tabla. We have heard jugalbandis before; but a vocal–sarod jugalbandi is uncommon. Such a performance demands a lot of versatility and virtuosity since the nature of human voice and a music instrument like Sarod and their scales are so different. The artistes started with an early evening raga — Puriya Dhanashree with a slow meditative Alap moving onto Jor. The vilambit gat/bandish in addha tal Mohe Lagi Lagan Guru Charanan Ki was finished with Shyam Shyam Ratata in drut teen tal. The duo presented their second composition – a bhajan in raga Desh in Dadra tal. The festive and joy-ous outburst of emotion of the raga poured out in this Shiva vandana Gale Bhujanga Bhashma Anga. It was a courageous jugalbandi experiment. It would be an accomplishment if the artistes can carry this experiment to a level when the voice and the instrument fuse and merge with each other. The resonant tone of the Sarod was missing in this part of the show. It sounded too tinny. It was not clear if this was due to improper sound mixing or due to instrument tuning. 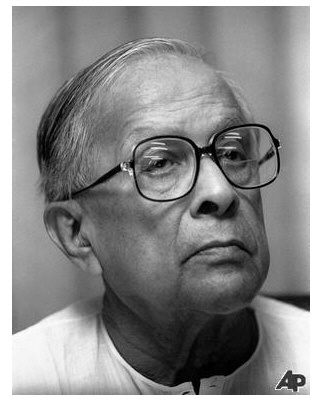 West Bengal’s Jyoti Basu (1914 – 2010): In his long Marxist rule, parts of state withered away, literally! Basu was West Bengal’s chief minister for 23 continuous years, a record unmatched in India, till he relinquished the job several years ago on account of senility. It should be noted that in the period after India’s Independence in 1947, Calcutta (Kolkata now) and West Bengal were models for others to emulate in India. So, people participating in the blogosphere could be biased. Mostly they are the Bengali intelligentsia, its Bhadralok. Basu himself was paradoxically a Bhadralok, son of a doctor, and himself a barrister from England. To have access to high-speed internet in India, you need to have some level of education and access to resources. So, I was looking for more objective measures on where West Bengal stands today, after over 30 years of proletarian Marxist rule with the “pragmatic manager” Jyoti Basu at the helm. Here are the observations of Praful Bidwai, a Delhi-based peace activist and a left-of-center writer. Bidwai’s article under the caption “Jyoti Basu’s Mixed Legacy” was published on January 23, 2010 in the The international News www.thenews.com.pk). ˜ The percentage of rural households in India not getting enough food every day in some months of the year is highest in West Bengal (10.6%), worse than even Orissa (4.8%), perhaps India’s poorest state. West Bengal has more than 900,600 school dropouts in the 6-14 age group, higher than Bihar’s nearly 700,000. Of India’s 24 districts which have more than 50,000 out-of-school children, nine are in West Bengal. According to India’s Human Development Report (2004), in West Bengal, spending on, and access to, health services stagnated. Antenatal care, women’s nutrition, and doctors and hospital beds per 100,000 people in West Bengal are below national average. West Bengal hasn’t opened a new primary health centre in a decade. India’s worst recent food riots occurred in West Bengal when starving people raided the stores of corrupt ration-shop owners, all CPM members. Meanwhile, some of the gains of Basu-initiated land reforms have eroded: 17% of registered tenants have lost their land and another 27 percent are vulnerable. Under Basu’s Marxist rule, quality of higher education for which Bengal was famous, nosedived. Under Basu’s reign, his party cadres permeated all state bureaucracy and held sway, and he could not control or discipline them for their wayward behavior. This is his “mixed” legacy. Even though this assessment will not be endorsed by all, a large section of educated Indians, and Bengalis in particular, believe that he was responsible for bringing down West Bengal to its knees, something even the British colonial power could not do. Basu’s Marxist rule caused flights of educated people, capital and industries to the other states and sapped Bengal of its vitality. These Bengalis are not going to return to Bengal anytime soon. His son Chandan Basu became an industrialist in Bengal when the state was under Marxist rule with the Marxist Jyoti Basu at the helm. Chandan Basu’s high-HP imported SUVs were confiscated for nonpayment of import duties. So much for Marxist proletarian ideology. English dailies even made a virtue of Basu’s atheism implicitly attributing it to his Marxist ideology. But atheism is not something that Indians had to learn from Marx, if only the anglicized Indian writers and editors take their time to know India’s own philosophical traditions. 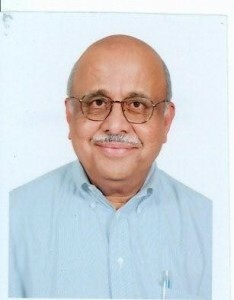 I moved to Chennai in March, 2009 for an one-year assignment with a chemical company. One of the attractions of the move was the famous annual music festival in the Tamil month of Marghazi (the solar month Dhanush) between mid December and mid January. The unofficial season starts in November itself with over sixty Sabhas (music associations) in the city organizing music concerts and dance recitals. This could very well be the world’s biggest music festival — over 4000 concerts in the greater Chennai metro area over eight weeks. Typical schedule at the most famous venue, the Madras Music Academy (The Academy for locals), has five concerts/day between 9:00 AM and 9:30 PM. The schedule follows a strict hierarchical grading of the performers. The prima donnas (male and female) get the evening prime-time slots with ticket prices steep by Indian standards. The aspirants get the rest of the slots with their own pecking order. Obviously, there is cut-throat competition to get on stage at the Academy and the successful people usually meet the basic standards. But connections, influences, recommendations, and local support also help! You can see varying shades of nepotism. A significant number of NRIs, particularly from the U.S., is in attendance with the books and other aids to understand the ragas and other nuances of Karnatic music. NRI artistes particularly from the US, Europe, and Singapore, taking advantage of the favorable exchange rates, have their own sabhas — Hamsadhwani and Musicians Living Abroad or MLA. Since it is not easy to get to go on stage in native sabhas, many of these NRI artistes perform in their own sabhas with other NRIs in the audience and later claim that their performance in Chennai was well-received by its discriminating and eclectic audience! Another strange trend, particularly in Bharatanatyam, and may be in other genre as well, is that often, the dancers pay the sabhas — and not the other way around — to get a chance to go on stage. Essentially, dancers with affluent parents/husbands, or their own resources pretty much buy their way to embellish their glitzy brochures. Locals complain that the NRIs garner the high-end tickets (inexpensive by the NRI standards) depriving the more dedicated Chennai music lovers affordable access. I had coffee one day and at my table were desis from California, Pennsylvania, New Jersey and Toronto!! I also met Mr. S. Raman, a retired government official from New Delhi who comes annually and attends only a selected number of concerts. He picks concerts with singers who he thinks perform according to the old Karnatic music traditions. He avoids the marquee crowd pullers. He also listens to young artists who get to sing for only ninety minutes. He was lamenting how the age-old Music Academy has changed for the worse with crass commercialism with sponsoring companies gaudily promoting everything under the sun in the premises!! Corporate logos as stage backdrops for saris, jewelry, hotels, and banks are jarring distractions. For many Chennai socialites, like socialites everywhere, attending concerts in the season is an annual ritual. Many women come in their best silks and diamonds. Often, they never miss an opportunity to engage in light conversations about the music just to make others aware that they are not totally ignorant! In the middle of a performance, sometimes, artistes greet the VVIPs arriving very late as they cavalierly glide into their front-row seats. This misbehavior both by the artistes and by the VVIPs galled me! 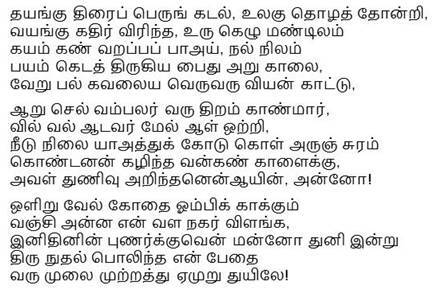 Another bad, rude feature in Karnatic recitals is audience leaving the auditorium during the percussion solo (called tani avartanam). They return after a coffee or a bio-break. These “hoary” traditions continue. Now I want to vent my ire on the most obnoxious audience misbehavior. Unlike western concerts or operas where entry to the auditorium is limited to the breaks between acts or songs, the audience here can drift in and out as they please. We see this in the US too, to a lesser degree. For star performers, all seats are sold, and late comers’ empty seats are scattered throughout. Late comers for these seats drift in at their leisure right in the middle of the recital. It becomes an annoying experience to witness a parade of rear ends disturbing you as they walk in front of you. People walk in 90 minutes late for a 150-minute concert!! More than 50% of people leave the auditorium before the concert formally ends. They are usually in great hurry, and you need to be careful. You can be trampled! What amazes me is that the people who behave like this are the well educated and the well heeled!! There is no consideration to provide special facilities for handicapped people. In fact, there are many hazards for them to climb and cross hurdles to get to their seats right from the moment they enter the main gate. It is not unusual to see persons, particularly women, offering a loud greeting to someone sitting about three rows ahead of or behind them and enquiring about their welfare! I tried to enforce some discipline, most of the time failing in my attempt. Only genetic engineering offers hope. In spite of all this, I did enjoy the twenty-plus concerts, having learned to live through these aggravations. Five hundred years ago, in 1510 CE, Afonso de Albuquerque defeated the Bijapur sultan to capture Goa and turned it into a fortified Portuguese colony in India. The Portuguese occupied Goa for the next 451 years till their expulsion by the Indian Armed Forces in 1961. In addition to the economic exploitation from colonization, the Portuguese brought forced conversions of Hindus to Catholicism, and 252 years (1560-1812 CE) of Portuguese Inquisition in India in which not only Hindus and Jews were persecuted for practicing their religion, but also anti-Hindu laws were enforced. This included death sentences. The inquisition in Goa was initiated by the Catholic missionary Francis Xavier (1506 – 1552, and made a saint in 1622), whose name adorns a well-known college in Mumbai. As an aside, this Church-initiated inquisition was the only religious persecution experienced by Jews within India, who migrated there after the destruction of their temple in the Siege of Jerusalem in the First Jewish-Roman War (70 CE). After achieving independence in 1947, the Indian government started negotiations to take Goa back. The negotiations failed, which led to India’s successful armed action in 1961. The US reaction is worth noting: Adlai Stevenson, the US Ambassador to the UN at that time, condemned the Indian government action, and demanded that all Indian forces be unconditionally withdrawn from Goa! Remember this the next time you hear the lyrics of the US national anthem, which, in the　American context, rightly glorify the US defense of Fort McHenry against the British Royal Navy in the Chesapeake Bay. Bhangra in the Burgh Blasted the Cold Away ! As January 2010 unveiled, students returned to Oakland after the year-end holidays. The frigid days and deep-freeze nights made their life miserable in the campus. Understandably, if they sought some escapist entertainment, they didn’t have to go too far. It was right there in Oakland itself. The 3rd annual Bhangra in the Burgh, held on Saturday, January 30 in Oakland despite the temperature in the teens, provided much-needed relief. Over 2500 people, mostly college students, both desi and non-desi and many older people converged at the cavernous Soldiers and Sailors Hall. Around 150 participating students, equal numbers of boys and girls, came from eight neighboring universities — Drexel, Cornell, Rutgers, Virginia Commonwealth, Georgetown, George Mason, Univ. of Virginia, Univ. Michigan (Ann Arbor) and of course, the home team CMU, hosts for the evening. They were everywhere — in the lobby, on stage, off stage – decked out in the bright, shiny, and colorful Punjabi costumes. The night provided raucous entertainment as an enthusiastic audience joined in the beats of songs rooted in Punjabi agrarian and rural ethos with liberal sprinkling of kudyan and munde (girls and boys) in the lyrics. The energy of the dancers was unbelievable as they effortlessly defied gravity with their airborne jumps. One could burn calories simply watching these young men and women in flight in their dance routines. At the end, Virginia Commonwealth U students were the winners. CMU undergraduate students Gurmukh Singh Chhabra, Suraj Baxi, and Vishal Agrawal, organizers of the event, with help from several volunteers, raised over $14,000 through the sales of tickets and snacks. The money went this year to Children’s Home of Pittsburgh (www.childrenshomepgh.org). Subway, Bruegger Bagels, and Starbucks donated food for the participants’ green room. India Garden in Oakland provided samosas — a must for this event — at discounted rates to help them raise money. If you haven’t experienced the energy of this annual event, you only have to wait until the next January. In the early decennial censuses — the first one was in 1790 — the purpose was for apportioning the number of seats in the House of Representatives in the Congress for each state. It was, and still is, based on the state’s populations in relation to the whole nation’s population. Consider this: As a percentage of the nation’s population, Pennsylvania’s population has decreased from 6.9% in 1900 to 5.0% in 2000, to 4.1% in 2008. 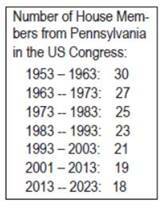 With the total number of House of Representatives in the US Congress held at 435, this has resulted fewer number of House members elected from Pennsylvania. Over the years, countless government agencies at the federal, state and local levels, nonprofits, and private businesses have come to rely heavily on the census data for their many decisions. For example, the federal gov-ernment annually distributes to states around $400 billion grant monies based on the states’ population demographics (number, age, gender, race, income/poverty data and others). This is where your participation in the US census becomes critical. This year, in March/April, all of you will receive a simple census form containing 10 easy questions. Please complete this form and mail it without any delay. But there are more reasons why you should do it. At a personal level, being an very small ethnic minority, we need to know where we stand in the big picture of the region’s/nation’s demographics. Often, many of us have an exaggerated idea of our presence. More on this in a separate article in a future issue. In the 2010 census, the US Census Bureau counts people tracing their heritage to India as a distinct group under the category Asian Indian. If your roots are in India, remember to check the box against Asian Indian on Question 9 in the census form. Pakistanis, Bangladeshis, Nepalis and Sri Lankans need to check the box Other Asians and write their place of origin in the box. An important point: When you fill out the census form, list all people living in your household irrespective of their legal status – citizens, immigrants, students from India, visitors, workers on H1B visa, or even undocumented people. The census form does NOT ask information on the legal status of the person. The Census Bureau’s mandate is to take a snap shot on the head count and gather the statistics only around the number of people, their ages, and ethnicity. The Census Bureau does not and will not share personal details they collect with any other government agency. As you see, census data is important in countless ways when dealing with federal, state and local governments, or other organizations. Completing the census form should take only ten minutes. Help yourself and your community by participating in this national exercise. If we do not participate in the census due to negligence/lethargy, while all others participate, we won’t be counted. And we stand to lose big time as individuals, and also as a local community and citizens at large. So, our own self-interest also compels that we take this seriously. A florist goes for a haircut in Bangalore. When he goes to pay the barber, the barber says, “I cannot accept money from you; I am doing community service.” The next morning the barber finds some jasmine strands at his door. A fruit vendor goes for a haircut and the barber again refuses to take the money. A few days later, the barber finds a basket of seasonal fruits at his door. The next Saturday when the barber goes to open his shop, he finds a bunch of software engineers waiting for a free haircut, with the printouts of forwarded e-mail of the free haircut. Strey answers, “No, I am them.” The confused dispatcher asks, “You am them?” “Yes, I am them.” The dispatcher then tells Strey to pull over so she doesn’t have an accident. Strey was charged last week with driving drunk and operating a vehicle with a blood-alcohol level of 0.1 or more. Strey was heard on the call asking if she should turn the car off and put her hazard lights on. Note: This is not a fabrication. this is a true story. Spanning three continents in his academic trajectory, Venkatraman Ramakrishnan at Cambridge University in England received the chemistry Nobel for 2009. It is perfectly natural for people to have an urge to bask in the glory of others with whom they can identify in terms of faith, race, ethnicity, culture, nationalities, and languages: He/she is also a _______ just like me); or through universities, schools attended or memberships in exclusive clubs, especially if you can use it to your advantage (He/she is also a ________ alumnus or alumna like me) etc. If you have doubt, go and talk to the hedge-fund billionaire Raj Rajaratnam, another desi, who was in the news for entirely wrong reasons. Raj Rajaratnam, the founder of Galleon Group, was arrested last fall for alleged insider trading involving tens and tens of millions of dollars. His alleged desi accomplices are Rajiv Goel, an executive at Intel’s treasury department, and Anil Kumar, an executive at McKinsey & Company. In fairness to Rajaratnam, he also had other mainstream American accomplices as well. I wonder, how many desis who were friendly with Rajaratnam on first name-basis in recent years would even acknowledge in public that Rajaratnam was their friends, or they were these his friends. Such is life. Life can be cruel. End Note: Preet Bahara, another desi and the United States attorney for the Southern District of New York, is going after Rajaratnam. I am sure Bahara now has lots of friends. His social calendar will be overflowing during the holidays. You are currently browsing the archives for the April 2018 category.